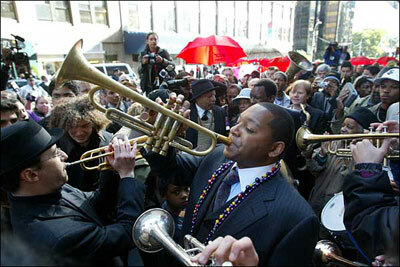 On October 18, 2004, at 10am, Wynton led a swinging group of musicians down the Broadway, on their way to the new Home of Jazz at Lincoln Center. Those in the New Orleans-style parade, as well as citizens of Manhattan and tourists belted out “When the Saints Go Marching In.” Office workers clapped from open windows. 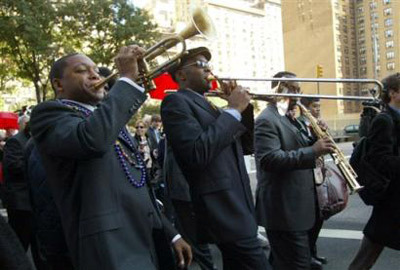 Some even started to jitterbug on the street as the musicians paraded from Lincoln Center’s Josie Robertson Plaza to the new Jazz at Lincoln Center marquee located on Broadway at 60th Street. Just so you know, I’m not yet getting married, but it has been a recent topic of discussion. So my question is currently hypothetical. If this question should not be directed to you, could you please direct it to whom it may concern? Wow!!! This was extremely amazing… I couldn’t help but shout with exitment, it’s so… so… so motivational, so inspirational, so amazing. I CAN’T DESCRIBE. All I know is this is AWESOME.